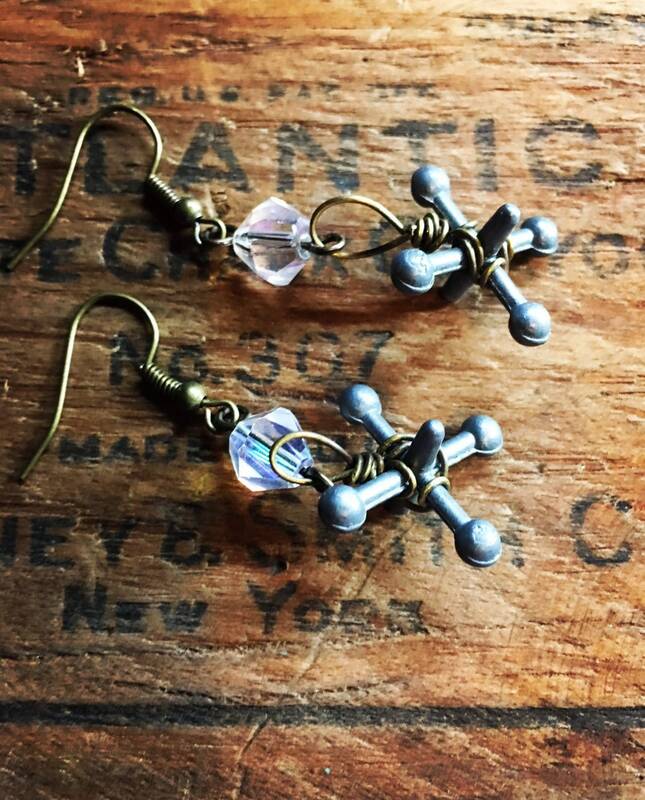 This is a fun whimsical set of earrings sure to start a conversation! 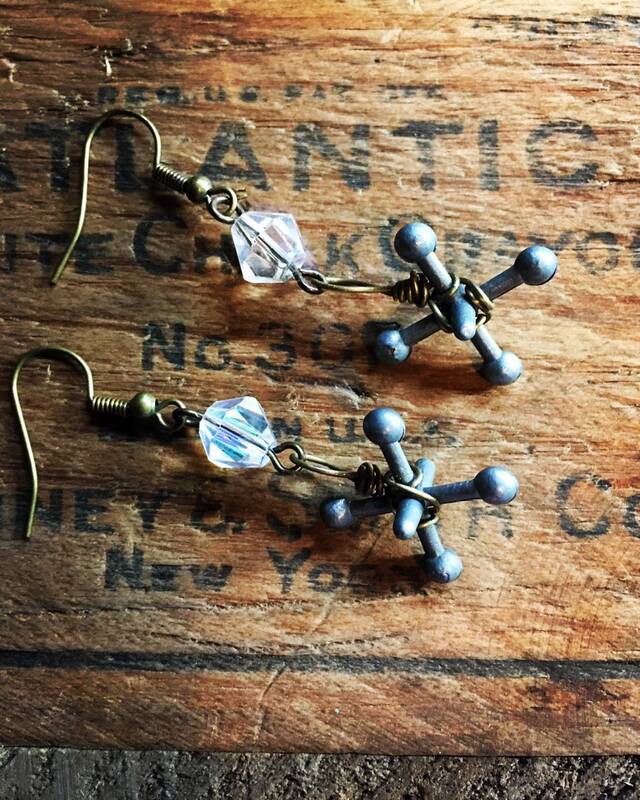 Made from two authentic vintage metal jacks and two AB crystals. These are light weight and the drop is approximately 2 inches. Please message me with questions prior to purchase. Payment is necessary at check out. All sales are final due to the nature of the items being one of a kind, feel free to contact us with any payment questions you may have. Thank you! We ship USPS. Although most items are ready to ship within 1-2 business days, some shipping times do vary. Please refer to the individual items details. Insurance is optional, so if you would like to add it you must contact me prior to check out. Also feel free to contact me if you have shipping questions or request and/or if you would like to know actual shipping charges before placing your order. Thank you! Due to the unique nature of our handcrafted items, we do not do refunds and/or exchanges. Any questions or request must be communicated prior to checkout. Thank you for your understanding. Once items have been shipped, We cannot be responsible for damage, this is why I highly encourage you to purchase shipping insurance. If you wish to add insurance please request it prior to checkout. We are frequently asked do you customize? The answer is YES! We would love to create a one of a kind treasure for you. 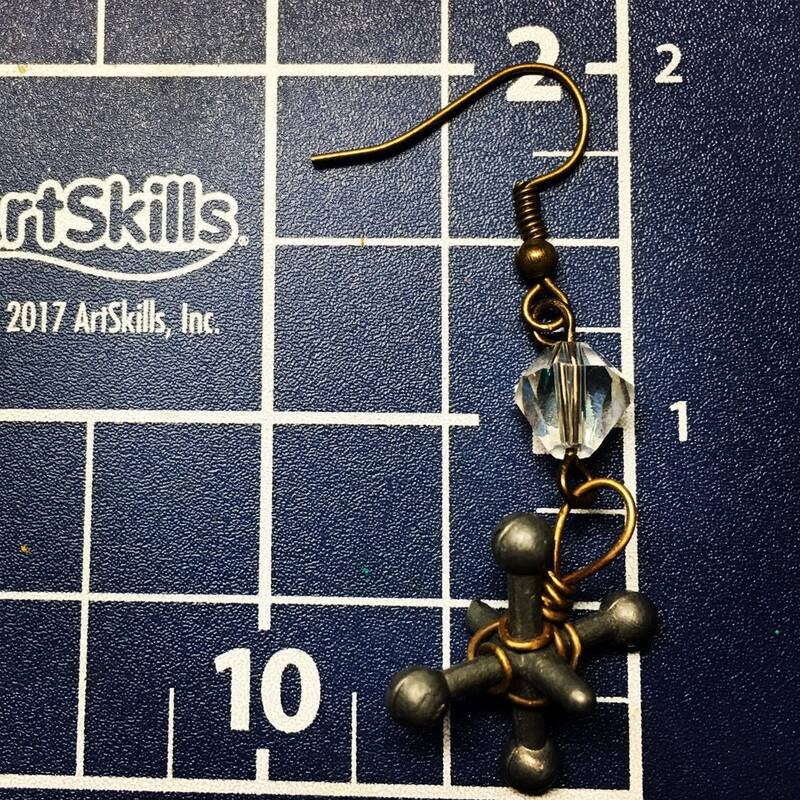 We often create new wearable jewelry from both men and women's vintage jewelry as well as vintage silver utensils and even things from Moms craft room like tins, bobbins, bits of fabric, hankies, buttons also from Dads work shop like nails,nuts, bolts, keys, rulers and more. We would love to discuss the many possibilities with you! Just go to our website www.twotwistedgypsies.com and at bottom of the page click on Contact Us. We try to respond as quickly as possible. We are always available to answer any questions you may have regarding the items you see listed. All of our items are from a smoke free environment so buy with confidence! Thank you for looking, hope you enjoy! !